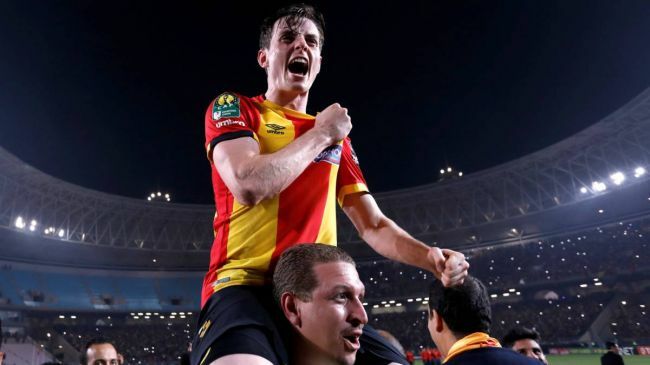 Former Bohemians and Longford Town attacker Ayman Ben Mohamed helped Tunisian champions Espérance de Tunis win the African Champions League in sensational fashion on Friday at the 60,000-seater Stade Olympique de Radès. The former Trinity College student was forced to miss his side’s 3-1 opening leg defeat through injury, but played the full 90 minutes last night as Esperance overcame their two goal deficit with a magnificent 3-0 victory. Ben Mohamed was born in London to an Irish mother and a Tunisian father and spent almost four seasons in League of Ireland football after being raised in Dublin — first lining out for UCD before spending one season at Longford and half a campaign at Dalymount Park. He joined Esperance following an impressive 2016 under Keith Long at Bohemians, with the player making his international debut for Tunisia last month during a 2-1 victory over Niger. Egyptian champions Al Ahly took a 3-1 lead into last night’s second leg, however a double from Saad Bguir either side of half-time, added to by another goal from Anice Badri sealed the Tunisian’s third Champions League title. Ben Mohamed starred for Bohemians during the 2016 SSE Airtricity League campaign and quickly became a fan’s favourite in Phibsborough. He earned his first ever international call-up for an Africa Cup of Nations qualifier against Djibouti while still in the League of Ireland back in May 2016. He studied BESS (Business, Economics, Political Science and Sociology) at Trinity before earning his move to Espérance in August that same year. Ben Mohamed began his career with St Joseph’s Boys before joining UCD in 2012 at the age of 17. The 23-year-old has since been converted to an attacking full-back in the Tunisian Professional League. Esperance will now represent CAF (Confederation of African Football) at the FIFA Club World Cup in the United Arab Emirates next month, alongside Champions League winners Real Madrid.